IPVanish is fast and configurable, with some interesting features. The apps have a few annoyances and they're not always comfortable to use, but if you're looking for both power and performance, we'd give it a try. All VPNs love to boast about their service, but US-based IPVanish goes further than most. It's "The World's Best VPN Service", yells the website, listing features like its 40,000+ shared IPs, 1,320+ P2P-friendly servers in 60+ countries, zero traffic logs, and live chat support available 24/7. Even better, the website explains, IPVanish is 'the world’s only Top Tier VPN service provider', which means the company owns and manages its own servers. That's good news, as it gives them more control over how the servers are set up and run, and demonstrates a level of resources and expertise which isn't always available with other VPNs. The service has a wide range of clients, covering Windows, Mac, Android, iOS, even Amazon Fire TV, as well as providing a host of setup guides for Linux, Chromebooks and other platforms. Other VPNs do something similar, but they pile on the restrictions. You might only be able to connect as few as three devices at once, for instance, and often these must belong to (and be used by) the account owner. IPVanish is refreshingly different, because not only does it support up to ten simultaneous connections, but these can belong to anyone in your household. A single account can cover your partner, your kids, everyone, potentially a real money-saver. The service has seen some significant improvements since our last review. In particular, IPVanish now has 24/7 phone, as well as live chat support. The Android app can now open a specified app after a successful VPN connection, a convenient touch. Elsewhere, welcome enhancements include more locations and servers, improved iOS auto-connect, and Russian and Hindi support for the Windows client. IPVanish offers three basic plans. You can opt to pay $10 a month, billed monthly; $8.99 a month, if you pay for 3 months up-front; and only $6.49 if you pay annually. This is decent value for the features you're getting, and very similar to other quality VPNs, although you can sometimes find better deals if you sign up for longer. NordVPN's annual plan is marginally more expensive at $6.99 a month, for instance, but commit to two years and the price plummets to $3.99. Payment methods are limited to card and PayPal only. The company used to offer Bitcoin and other options, but not any more. Although this isn't the most appealing of starts, there's some good news, too. All IPVanish plans are clearly described, allowing you to see the total you'll pay and the billing frequency at a glance. And the company doesn't try to catch you out with sneaky clauses in the small print. You don't lose the right to a refund if you've logged on more than x times, for instance, or used more than y GB of data. If you're unhappy, ask for a refund within the first seven days and you'll get your money back, no questions asked. IPVanish protects your privacy with its use of rock-solid, industry-standard AES-256 encryption, and its support for the highly secure protocols, OpenVPN and IKEv2. The IPVanish apps go further by giving you an unusual level of control over their OpenVPN setup. The ability to choose your OpenVPN port (1194 or 443) may help you get connected, while an 'Obfuscate OpenVPN Traffic' option reduces the chance of your VPN tunnel being detected or blocked in anti-VPN countries such as China and Iran. The Windows client offers a kill switch, DNS and even IPv6 leak protection to reduce the chance that your real identity will be exposed online, for example if the VPN connection drops. The mobile apps don't have a built-in kill switch, making them potentially more vulnerable if the VPN drops unexpectedly. IPVanish pointed out to us that Android 8 and later has a built-in kill switch (System Settings > Wireless and Networks > More > VPN, choose VPN app, enable 'Block connections without VPN'), but that may not be available on every device. Even if it is, it requires the user to enable it, and the setting must be managed separately from the VPN. That might be acceptable for experts, but we think it's preferable to be able to view and control the kill switch status from within the VPN app. While that's a small concern, there are some privacy plus points elsewhere. For example, the iOS app enables creating lists of wireless networks which IPVanish will always protect, and others which it can ignore, as you know they're safe. You can then mostly leave the VPN to turn itself on and off as required, preserving your privacy at all times. To confirm the service really does preserve your identity, we checked for leaks at sites including IPleak, DNS leak test and Do I leak. None of the tests revealed any issues, with the apps shielding our real IP address at all times. Point your browser at IPVanish's website and you'll read what seems to be a clear no-logging policy. "Our strict zero-logs policy keeps your identity under wraps. We do not record any of your activity while connected to our apps in order to preserve your civil right to privacy." 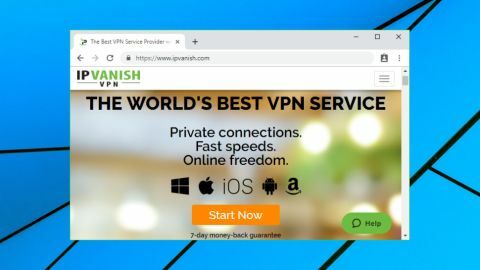 "IPVanish is a zero-logs VPN service provider, which means that we do not keep a record of any connection, traffic, or activity data in regard to our Services"
There were some concerns raised in June 2018, when a document emerged showing that the zero-logging IPVanish had in 2016 responded to a summons from the US Department of Homeland Security by handing over information on a user's activities, including connection and disconnection times and possibly the use of specific protocols. IPVanish had been sold since this happened, and Lance Crosby, CEO of new owner StackPath, stated that he had no knowledge of the background to this case, and independent audits and current practice ensured there were no logs of any kind. Whatever the story here, it's more confirmation that VPN logging claims can't always be trusted. The headline "zero logging" boasts on the website won't necessarily be reflected in company practice. Does that necessarily mean you should avoid IPVanish, though? We would say not. The logs were handed over under the previous management. The current owner, StackPath, is a major cloud services provider who has now tied itself, very publicly, to the statement that "With no exception IPVanish does not, has not, and will not log or store logs of our users as a StackPath company." To be involved in any future logging controversy would be hugely damaging, and we suspect StackPath will be going to considerable lengths to make that happen. This doesn't in any way guarantee your safety, but we still think StackPath's public promises have more weight than the website marketing efforts of most other VPNs, where in some cases you can't even tell who owns the company. Customers shouldn't have to rely on anyone's zero-logging promises, of course. VPN providers such as NordVPN and VyprVPN have tried to reassure their customers by allowing external companies to audit their systems and find out what's really going on. Hopefully IPVanish - and the rest of the industry - will do the same. Assessing the performance of a VPN takes time and work, so we used multiple tests and techniques to see what IPVanish could do. This started with a custom benchmarking program which automatically connected from the UK to more than 50 IPVanish servers, logged the connection time, ran a ping test to look for latency issues, and used a geolocation service to confirm our new IP was where IPVanish had promised. One immediate highlight is that even after running the test twice, and attempting more than 100 connections, we only had a single connection failure (we've seen failure rates of up to 10% with some of the competition.) We can't give a definitive verdict from a short-term test, but as IPVanish had no failures at all in our last review, it looks like the service is more reliable than most. In the last review, our geolocation checks appeared to show that some of our test servers weren't located where we expected (an Amsterdam server seemed to be in Portugal, for instance, and servers in Singapore and Korea were reported as being in Dallas.) Whatever the reason for those apparent issues, they didn't show up this time. We only found a single location with a possible problem (an Indian server, which geolocation checks suggested was in France), but on closer inspection this turned out to be incorrect. The geolocation library was wrong, and IPVanish was right: the server was in India, after all. Next up, we used Netflix Fast, Ookla's Speedtest and other benchmarking websites to find the download speeds of several IPVanish websites, including 10 in the UK, 15 in the US, 15 across Europe and 16 spread around Asia and Australasia. Download speeds from our local UK servers were excellent at 60-70Mbps on a 75Mbps fiber broadband line, only fractionally lower than the maximum 72-73Mbps we could achieve with the VPN turned off. European speeds started well, with near European countries - France, Germany, Netherlands - regularly hitting 65Mbps. They tailed off with distance, though remained generally acceptable, with for example Spain managing 40-45Mbps. Only Greece proved to be an issue during testing, with download performance dropping to 8-12Mbps. US servers delivered quality results across the board, with our nearest east coast servers peaking at an impressing 65Mbps, and even UK to Los Angeles connections reaching a capable 45Mbps. Unsurprisingly, the long-distance servers showed the greatest variation, from Singapore's perfectly adequate 35Mbps and Australia's 30Mbps, down to one or two locations which are almost useless (Malaysia often struggled to reach 1Mbps.) Still, even here, most servers performed very well, and overall IPVanish is faster than the bulk of the competition. US peak performance outpaced ExpressVPN and matched NordVPN at 90-100Mbps. UK speeds weren't as impressive at 50-55Mbps, though still very acceptable. It was much the same story with our long-distance connections, where Singapore's very usable 30-35Mbps was typical, but there were occasional exceptions, like Malaysia's 2-2.5Mbps. Overall, IPVanish performs better than most, and if you're using the best served locations - US, UK, Australia, Singapore - you'll probably be happy. But some of the less-common locations can be slow, and you'll get better all-round performance from big-name competitors like ExpressVPN and NordVPN. IPVanish has a very large network, and that generally means there's a good chance it will allow you to access geo-blocked sites, such as Netflix. To check IPVanish's unblocking abilities, we used an automated testing tool to log into 3 UK servers, 10 in the US, and see whether these allowed us to access BBC iPlayer, US YouTube and US Netflix. None of the UK servers enabled streaming from iPlayer, a little disappointing. That's a major change since our last review, too, when we were able to access iPlayer on every location we tried. All US servers allowed us to watch geoblocked YouTube clips. That's not such a big deal - everyone else does, too - but we like to check, anyway, just to confirm there are no problems. Best of all, every IPVanish test server gave us access to US Netflix, a real achievement when Netflix goes to such efforts to block VPNs. Netflix availability can change quickly, and we've seen many IPVanish reviews on the app stores suggesting that the service didn't work for them. But we can only review what we see, and even if you do have trouble, we've found IPVanish live chat support was able to give us working locations within a couple of minutes of us asking the question. No VPN can guarantee Netflix access over the long term, but IPVanish seems better able to cope with these complications than most. There are no limits on the amount you can download, either with a fixed data transfer allowance or by throttling connection speeds. There are no restrictions on your choice of locations, unlike many competitors. P2P traffic is allowed on every IPVanish server. The only small negative here is that IPVanish doesn't support payment via cryptocurrencies. But if no-one can identify an internet action to your account, that's not a big deal. And overall, once again, IPVanish performs better than most of the competition..
IPVanish directly supports a wide range of platforms, with clients available for Windows, Mac, Android, iOS and Fire TV. There are no browser extensions, but the support pages have setup guides for Chrome and Firefox, as well as tutorials covering routers, Chromebooks, Linux and more. The app download links are easy to find on the website, and, conveniently, you don't have to log in to your IPVanish account to access them. There are no big surprises during the client setup process (or any small surprises, really.) The Windows and Mac clients install like any other, iOS and Android apps may be installed from their app stores, and there's a bonus direct download of the Android APK file for experts who need more control of the setup process. If you're not interested in the official clients, IPVanish has manual setup tutorials for Windows, Mac, Android, iOS, Linux and others. These aren't as numerous or detailed as we've seen at ExpressVPN, but there's still plenty of information here. The website has twelve tutorials just covering Windows, for example, with separate guides covering OpenVPN, PPTP, L2TP and IKeV2 setup on Windows 7, 8 and 10. If you're using OpenVPN or anything else OpenVPN-based, you'll also appreciate IPVanish' sensible naming of its .OVPN configuration files. While NordVPN starts file names with a country code, like 'us2356.nordvpn.com.udp.ovpn' (poor practice if you're mixing files from different providers) and doesn't mention the region, IPVanish leads with its own name and includes the city, too ('ipvanish-US-New-York-nyc-a01.ovpn'), making it far easier to read and use. If you've used several VPN clients, you'll know they're mostly very similar. There's a list of locations, a Connect/ Disconnect button, a page of settings, and generally nothing else at all. Once again, IPVanish does things differently. Its clients can look more complex than the competition, but that's mostly because they have more features and functionality than just about anyone else. The Windows client is a great example. The opening Quick Connect panel wastes most of its screen real estate with multiple 'Not Connected' warnings, hides your country choices in a drop-down list so it takes a click just to display them, and includes Connect/ Disconnect and On/ Off buttons which both do essentially the same thing. If you don't like this interface, one click and you've viewing a more conventional country list. This looks more like other clients, but again, IPVanish has added extra features. A search box enables filtering the list by keyword. You can sort the list by country, load or response time. You're able to add servers to a Favorites list with a click, and these can be sensibly displayed at the top of the country list, rather than hiding them away on a separate tab. Switching servers when connected is fractionally more difficult than we would like. If you're using a New York server and double-click London, for instance, you must confirm you want to switch before the client will disconnect and reconnect. Most clients will save you a click by switching servers as soon as you ask. IPVanish also allows selecting locations from a map, and it makes a better job of implementing this than most. Pan the map over to the US, for instance, and instead of being confronted with a mass of overlapping location markers, the map displays only four. If you know you're after an east coast location, zoom in there and more locations appear, with numbers representing how many servers they offer, so for instance we could see there were 55 servers in New York, 67 in Washington and 57 in Los Angeles. Click any location and the client automatically connects to the best available server. Even the Settings dialog delivers more functionality than we expected. You can switch protocols between IKEv2, PPTP and L2TP, as well as OpenVPN TCP and UDP. You're able to choose an OpenVPN port (1194 or 443). There's both DNS and IPv6 leak protection. You can define which server IPVanish uses when the client starts, repair the IPVanish OpenVPN driver if it's affected by another VPN, and view the OpenVPN logs within the interface to troubleshoot problems. The Windows client has a few small usability issues, then, but overall it performs very well, and old VPN hands in particular will appreciate its lengthy feature list. The IPVanish Android app opens with a simple Quick Connect screen which displays your current IP and location, lists a target country, city and server, and provides a Connect button to speedily get you online. The default country seems to always be the United States, which is unusual and a little inconvenient; most VPN apps initially choose the server nearest to you. Still, it's clear and straightforward, and if you've ever used another VPN app you'll immediately feel at home. If you don't want to connect to the US, you're able to set your destination country, the city within that country, or choose a specific server with a couple of taps. Just like the desktop client, once you're online the app displays a real-time scrolling graph showing your upload and download data rates. We're unsure whether there's anyone who actually needs this, and presumably it will reduce your battery life if you leave it open for a long period of time, but there's no doubt it looks better than the usual dull country list. The app presents some genuinely useful status information along with the fancy visuals: your new IP address, server name, location, time connected, and so on. It's welcome reassurance that the system is working as you would expect. You're able to select new locations from a lengthy list of countries. Slightly oddly, this displays the city first, but sorts by the country, so the list begins "Tirana, Albania; Melbourne, Australia; Vienna, Austria" and so on. This makes it more awkward to read, although you'll still find what you want quickly enough. Fortunately, there are plenty of ways to change this. You can sort the list by city, for instance ("Amsterdam, Netherlands; Ashburn, United States; Athens, Greece".) You can choose to display only the servers within a particular country, or filter locations by ping time, far more options than you'll typically get with other VPN apps. While that's all very flexible, the app spoils the effect by not including any form of Favorites system, and so forcing you to manually locate specific servers in the lists whenever you need them. That can be a hassle on mobile devices where you must scroll for and select locations on a small screen. The app has more settings and options than most of the competition. You can choose to make OpenVPN UDP or TCP connections, optimizing for speed or reliability. There's a wider choice of ports than you'll see with the Windows client (443, 1194 and 8443.) A Scramble feature makes it more difficult for networks to detect and block VPN connections. Most interesting of all, a Split Tunneling feature allows you to select apps you don't want to use IPVanish, great news if some of your apps don't work with VPNs. ExpressVPN has something similar, but otherwise that's an option you'll rarely find elsewhere. As we discussed above, there's no built-in kill switch to prevent your real identity leaking if the VPN connection drops while you're using it. You can set up Android's own kill switch on most devices, as long as they're running Android 8 or later, but that's not as convenient as we would like. Still, it's possible, and the app does have an integrated auto-reconnect feature which makes some effort to reduce your exposure. Once you are online, there's similar eye-candy in the shape of a scrolling real-time internet traffic graph. This isn't exactly necessary, but it's at least good (and very unusual) to see a VPN app with some visual style. If you prefer, you can also select locations from a simpler text list. As with the Android app, this can be sorted by country or city, but these fields are displayed in separate columns which makes the list much easier to browse. Server load and ping times are displayed, too, helping you to figure out which is the best location for you. Even better, and unlike the Android client, the iOS app supports a simple and straightforward favorites system. Tap the star to the right of one or more servers and it'll appear whenever you choose the Favorites tab, allowing you to avoid all the other filtering and sorting hassles entirely. The Settings pane looks sparse, at least initially. As with the Android, there's no integrated kill switch to protect your identity, and you only get two significant VPN tweaks: an auto-connect option, and the ability to switch protocol between the default IKEv2 and IPSEC. Check out that auto-connect feature, though, and you'll find a stack of options and controls. As well as a basic "connect automatically" setting, you can have IPVanish automatically turn itself off when you're connected to trusted cellular networks. You're able to build whitelists and blacklists of wireless networks, so IPVanish knows which connections to protect, and which are safe. You can even build a list of domains which you'd like IPVanish to automatically protect, so for example you could have the VPN kick in whenever you visited Netflix's website. The IPVanish iOS app isn't perfect, then, but unlike many competitors, it's not just a basic port of the desktop client, either. There's real power here, and we'll be interested to see how it develops in future. If the VPN isn't working as it should, the IPVanish Help Center aims to point you in the right direction. A System Status link warns you of any big company-wide problems, support articles are intelligently organized into key categories (Setup, Troubleshooting, Billing, more) and you can search the web knowledgebase for specific keywords. The articles aren't quite as polished as you'll see with ExpressVPN and other top competitors, but they're not bad, and there's plenty of information to explore. You don't just get one or two generic setup guides, for instance-- there are multiple tutorials for Windows, Android, iOS, MacOS and Linux, as well as guidance on using the system with ChromeOS and various routers, and related advice for using it with Roku, Chromecast and Kodi. There are more issues with some of the troubleshooting guides. The 'Slow Speed Troubleshooting' article, for instance, mentions the basic facts, but only briefly, and its advice isn't always clear. ('Try all the different VPN types that are available' means what, exactly?) The ExpressVPN equivalent is far better, with much more detail, step-by-step guides, and links to related articles. If you can't find an answer in the knowledgebase, live chat is available on the website. We posed a couple of questions, 12 hours apart, and in both cases the chat window told us we were first in the queue, an agent responded and began giving us accurate and genuinely helpful replies within two minutes. That's a great performance, and a major improvement on the "send an email and wait" approach of other services. If you prefer to send an email directly to the support team, anyway, you can still do that. Response times are average - we waited around 12 hours - but replies are just as helpful, and you should have all the details you need to fix most problems within a couple of messages. IPVanish is fast, with highly configurable app and excellent live chat support to help keep everything running smoothly. But there are some problems, too, and issues with usability and a scattering of smaller problems are just enough to keep it off the top spot.